2a. What is Radioactivity? What causes it? 2a. What is Radioactivity? and why does it happen? The nucleus is composed of protons and neutrons and glued together by a strong attraction BUT only certain combinations of the n/p ratio seem to be stable (see stability curve graph on right). 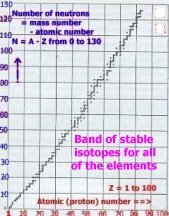 Any isotope of any element that does not lie in the stability band with a stable n/p ratio is likely to be radioactive! Radioactivity results from the random and spontaneous breakdown of the unstable nucleus of an atom. This breakdown is called radioactive decay (nuclear decay) of the unstable nucleus of the atom (radioisotope). In the breakdown of the unstable nucleus, energy is released by the emission (usually) of three types of ionising radiation (nuclear radiation) called alpha particle radiation, beta particle radiation and gamma ionising radiation (see diagram below). These emissions are ALL high velocity and high energy particles or radiation. Alpha particles are positive, mass 4, 2 protons (+, single plus) combined with 2 neutrons. Gamma radiation emission often accompanies alpha and beta particle emission - its a way that newly formed and temporarily unstable nucleus gets rid of its excess energy to become more stable. When an unstable nucleus splits a different nucleus with a different number of protons is formed, as well as the emission of radiation, and so a different element is formed (NOT possible in chemical changes, but this is a nuclear reaction!). The breakdown of an unstable atom is referred to as radioactive decay or radioactive disintegration. It is a totally random process meaning it is a matter of chance which particular nucleus decays. For more details about radiations, see detailed table of information in 4a. on the three types of radioactive emission, alpha, beta and gamma ionising radiations. Because it involves high energy nuclear changes, radioactivity is completely unaffected by the temperature, pressure, physical state or chemical state of the atoms. You cannot alter the rate of decay at all! The energy changes involved with nuclear changes like radioactivity, are much greater, than those for physical or chemical changes of materials like boiling or fuel combustion etc. I've some calculations in section 4. to prove this point. 2b. How did they find out there were three types of atomic ionising radiation? A radium source was used, which also contains other radio-isotopes, and a lead casing was the only safety precaution used! How people like Marie Curie and Ernest Rutherford etc. survived beyond the age of 60 is a mystery! Anyway! it was found that the original 'emission' from the radioactive radium source was split into three beams by an electric or magnetic field (diagram on the right). (i) The alpha beam was attracted/deflected towards a negative plate, showing it was positive, since opposite charges attract/like charges repel - the rules of electric charge interaction. (ii) The beta (negative electrons) beam bent towards a positive plate (showing it was negative). (iii) The gamma beam passed through un-deflected (showing it had no charge). Note: Although the alpha particles have the biggest charge of +2, the beta beam (smaller charge of -1) is more easily deflected because of its much smaller mass (nearly 8000 x smaller, mass ratio for He2+ : e- is 4 : 1/1850). Note that in other nuclear particle separation experiments, a proton (+), or any other positive particle beam, bends towards the negative plate. Other experiments have detected positron (positive electron) emission from beta plus radioactive decay. five word-fills on radioactivity * Q2 * Q3 * Q4 * Q5and ANSWERS! crossword puzzle on radioactivity and ANSWERS!